There are many laws that help to protect the health and wellbeing of Maine people. Retailers and workplaces are not only obligated to meet the requirements of the law, but can provide healthy workplaces for their employees that contribute to a healthier workforce and a better bottom line for their businesses. Enclosed areas where work is performed, as well as in all rest rooms, meeting rooms, lunchrooms, and private offices. Employer-owned or -leased vehicles used by employees, and in employee-owned vehicles used in the course of work whenever other employees or another person is in the vehicle for work-related reasons. Residential facilities licensed by DHHS when an employee is physically present to perform work there. Within 20 feet of entrances, windows, vents and doorways of the workplace. Any location that will allow smoke to circulate back into the building. Employers are responsible for the development and implementation of a workplace smoke-free policy that addresses the laws. Maine employers may not discriminate against or refuse to hire tobacco users. The legal age to purchase and consume alcohol in Maine is 21. 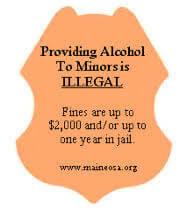 Any person who sells liquor in Maine must obtain a license from the Division of Liquor Licensing and Enforcement. The Maine Liquor Liability Act ensures that if an injury or death occurs due to alcohol use, the person responsible for furnishing the alcohol may be charged with a felony. Under the Occupational Safety and Health Act, employers are obligated to respond to alcohol use and related-harm in the workplace. Employers cannot fire, refuse to hire, or refuse to promote someone simply because she or he has a history of substance use or is enrolled in an alcohol rehabilitation program. Under the federal Control Substances Act of 1970 (CSA), it is illegal to cultivate, process, use, or distribute marijuana. Maine’s Marijuana Legalization Act legalized recreational use of marijuana in January 2017. An employer is not required to to permit or accommodate the use, consumption, possession, trade, display, transportation, sale or growing of cannabis in the workplace. Employers are permitted to enact and enforce workplace policies restricting the use of marijuana by employees and to discipline employees who are under the influence of marijuana. Employers may not refuse employ or otherwise penalize a person 21 years of age or older solely for that person’s consuming marijuana outside of work property. The Drug-Free Workplace Act of 1988 requires federal contractors with contracts of $100,000 or more to maintain drug-free workplaces. Law enforcement, national security, the protection of life and property, public health or safety, or other functions requiring a high degree of public trust are subject to mandatory drug testing. Any employer who wants to have a substance abuse testing program (but is not required to under federal law) must submit a policy to the Maine Bureau of Labor Standards. Several laws prohibit the invasion of privacy, wrongful discharge, defamation, and discrimination regarding drug testing, as well as alcohol and drug abuse. Community members can help the fight against tobacco misuse by reporting compliance violations that occur in workplaces. NO BUTS! (Blocking Underage Tobacco Sales) is a free, voluntary program designed to help owners and/or managers adopt practices and policies that help block sales to minors. Online employee training is available. Stores benefit from participating in the program as those that complete the requirements are eligible to earn compliance credits which can be used should a violation occur. Project Sticker Shock is designed to reach adults who might buy alcohol legally and provide it to minors. Stickers warning about the penalties for furnishing alcohol to minors are placed on alcohol products. The project represents a partnership between youth, retailers, parents, community members, prevention professionals, and law enforcement. The goals are educating potential furnishers, raising public awareness about underage drinking, and strengthening the impact of the law on the decision to provide alcohol to minors. 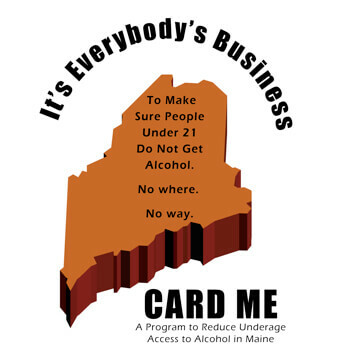 The Card ME Program is a voluntary responsible retailers program that helps to reduce illegal and/or irresponsible alcohol sales and service by providing tools to improve responsible retailing efforts. The program aims to make it more difficult for underage and visibly intoxicated persons to obtain alcohol and to build stronger community norms around limiting alcohol availability. The policy generator assists liquor licensees with developing internal policies that may help them stay compliant with Maine liquor laws and assists employees with the responsible sale of alcohol. Developing a drug free workplace is a good way to protect your bottom line and the health of your employees. With Work Alert you can implement an effective substance abuse policy in three easy steps. Step 1: Involve key employees for input and advice. Step 2: Customize a policy that is right for your workplace. Step 3: Share the policy with all employees. Creating a smoke-free workplace may be one of the best business moves you ever make and will ensure you are meeting the requirements of the Workplace Smoking Act. There are resources and sample policies available to assist you in creating your own policy.